A booklet is a great way to get the word out: about products, about services, about events. From real estate to retail, booklets remain a powerful marketing tool. Maybe you’re a designer, an ad agency or a retail print reseller, and you just don’t have the means to print high-quality booklets for your customers. Our wholesale booklet printing is here to save the day. Booklets offer more information than a flyer and less than an entire book, helping customers to really gain a feel for a company or service. A well-designed booklet can introduce prospective customers to all of the services offered by an organization, and include examples to display the company’s high-quality work. But in order for the booklet to have the desired effect, it needs to truly catch people’s eye, and in order to achieve that reaction, standard printing practices just won’t suffice. Booklet production printing is very lucrative in terms of sales revenue. 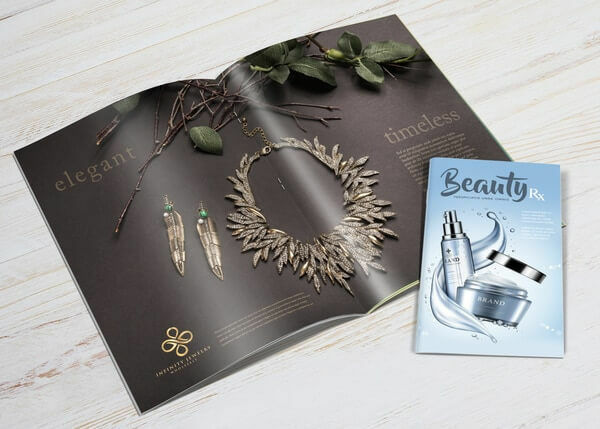 We offer a wide variety of choices to ensure your booklet effectively showcases your customers’ products and services to perfection. Our booklet printing services are tailored to meet the specific needs of your customers. We offer you the chance to select the exact quantity of booklets you need, so that you can fill orders with ease. Many wholesale booklet printing companies force you to place a very large order that you’ll never be able to use. Not only is this a waste of your money, it’s also bad for the environment. You won’t get that with Color FX Web. It’s our goal to make the printing process quick, easy and cost effective. We understand the needs of your business, because we share many of the same needs, concerns, and goals. That’s why Color FX Web treats you not simply as a customer, but as a business partner. We start by assigning a dedicated account representative to your account. Our team is with you every step of the way, to ensure your finished booklets far exceed your customers’ expectations. Your account representative will serve as your point of contact for all of your questions throughout the process. Ready to get started? Contact Color FX Web today, or register on our site. Standard Wholesale Booklet Printing: Printed on 100#, 80#, 70#, 60# Gloss Book with AQ Coating or 70#, 60# Offset Uncoated Text without coating Full Bleed Folded to 5.5" x 8.5", Saddle Stitched two places on 8.5" height, flush trimmed on 3 sides. Standard with Cover Wholesale Booklet Printing: Printed on 100# or 14pt Gloss Cover Full Bleed with AQ Coating Folded to 5.5" x 8.5", Saddle Stitched two places on 8.5" height, flush trimmed on 3 sides. Standard with Presentation Folder Cover Wholesale Booklet Printing: Printed on 100# or 14pt Gloss Cover Full Bleed with AQ Coating in 6"x9" Presentation Folder with 3" Pocket on the right side with 1 Business Card slit, stitched on 9" height flush to bottom. Tabloid Wholesale Booklet Printing: Printed on 100#, 80#, 70#, 60# Gloss Book with AQ Coating or 70#, 60# Offset Uncoated Text without coating Full Bleed with AQ Coating Folded to 8.5" x 5.5" Saddle Stitched two places on 5.5" height flush trimmed on 3 sides. Tabloid with Cover Wholesale Booklet Printing: Printed on 100# or 14pt Gloss Cover Full Bleed with AQ Coating Saddle Stitched with cover on 5.5" and Score Folded to 5.5" x 8.5". Tabloid with Presentation Folder Cover Wholesale Booklet Printing: Printed on 100# or 14pt Gloss Cover Full Bleed with AQ Coating in 6"x9" Presentation Folder with 3" Pocket on the right side with 1 Business Card slit, Stitched on 6" height flush to bottom. Slim Wholesale Booklet Printing: Printed on 100#, 80#, 70#, 60# Gloss Book with AQ Coating or 70#, 60# Offset Uncoated Text without coating Full Bleed with AQ Coating Folded to 8.5" x 4.25", Saddle Stitched two places on 8.5" height, flush trimmed on 3 sides. Slim with Cover Wholesale Booklet Printing: Printed on 100# or 14pt Gloss Cover Full Bleed with AQ Coating Folded to 8.5"x4.25", Saddle Stitched two places on 8.5" height, flush trimmed on 3 sides. Slim with Presentation Folder Cover Wholesale Booklet Printing: Printed on 100# or 14pt Gloss Cover Full Bleed with AQ Coating in 6"x9" Presentation Folder with 3" Pocket on the right side with 1 Business Card slit, Stitched on 9" Flush to Bottom side. Please Note: Quantities of 2500 or less on 70# offset uncoated text paper will be printed digitally and is not compatible with most laser printers. Mailing Services fee for Booklets: List processing fee of $45 for one list and $15 for each additional list, $79 per 1000 Injekt charge and a postage fee (refer to our Direct Mailing section for details). Booklets are eligible to mail at either Letter or Flat rates, depending on the size and weight per piece. 8.5 x 5.5: 100# Gloss Book, 8 pager: 2,500 qty. - 840 per box - 3 boxes @ 33lbs. = TOTAL weight of 100lbs.